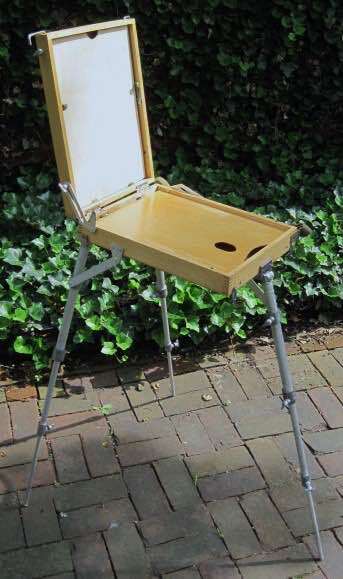 The Yarka Russian Easel is an alternative design to a French Easel and is like a Pochade Box with its own integrated legs. This easel is known as a Yarka “Russian French Easel”. It was distributed in the US for a short while during the nineties. It was distributed at that time by Jerry’s Artarama, and Jack Richeson & Co. The name of the Russian manufacture is Podolsk-Art. The Yarka comes in several sizes. The medium size measures 11 x 16 x 4 inches deep. It has a wooden palette and another piece of wood inside the lid. It has a much better system than a French Easel system for holding your palette since the palette sits on top of the larger tray, or you can remove the compartments and put the palette actually inside the box. The canvas sits on the hinges just above the palette for large works, or on the two metal pieces that swivel out from inside the lid for smaller work or to raise the work higher. There are two metal rods that clamp the top of the panels to secure it in place. These rods also hold the lid shut when closing the box. It is a very simple but functional design.